Perhaps you have the impression that meditation is hard to do. It must be for a gifted few with orderly, peaceful minds, right? Nothing could be further from the truth. Meditation can be easy for anyone. In fact, as you’ll soon see for yourself, it has to be easy or it won’t work. Yet this principle appears to contradict common sense: to achieve anything of value in this world requires effort. Just look around. Humankind’s greatest achievements — in science and technology, in building corporations, in the creative arts — have been the product of effort. And those who made the effort to discover, build, or create those achievements also made the effort to acquire the knowledge necessary to excel in their fields. When it comes to meditation, however, the only effort required is to make the time to do it. Granted, this can be a challenge in our busy, achievement-oriented society, but once you’re actually sitting down and you close your eyes and begin, no effort is required. In fact, effort at that point will land you further from success. 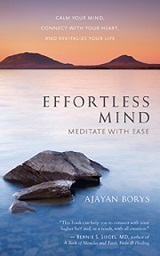 Why does effort yield positive results in nearly everything except the process of meditation? Simply put, achievement in the world is in the field of action, in the field of doing; meditation is in the field of being. Meditation is about doing less and less until you are doing nothing, simply being, abiding in the core of your innermost Self. At that point, the ego-mind, which is accustomed to always doing and trying, has temporarily dissolved. This is why meditation is effortless, why it must be effortless: the ego-mind can’t dissolve itself by doing. Doing only keeps it intact. In this respect, meditation is much like falling asleep (another common case of shifting from the waking state to another state of consciousness). Consider what happens every night when you go to bed. You turn off the lights, lie down, and after some time passes, you fall asleep. When it comes, sleep comes effortlessly. Other than setting up the proper conditions for sleep — turning off the lights, lying down comfortably, and so on — you can’t do falling asleep. In fact, as every insomniac knows, the more you try to fall asleep, the more surely you will lie awake tossing and turning. Only when you completely forget about trying to fall asleep does sleep come. The same holds true for meditation: making an effort to meditate only interferes with the process. You will have the best meditation when you approach it with the innocence of a child falling asleep. The child is simply tired, and so nature takes over and sleep comes, with ease. As Christ said, the kingdom of heaven is within you, and you must be as innocent as a child to enter it. Throughout our lives we have all learned to make an effort to one degree or another in order to achieve our goals. This may bring us success in the world, but not peace or fulfillment. For fulfillment, both the inner and outer aspects of life need to be full. We must become as expert in the field of being as we are in the field of doing. This will not only bring inner peace and well-being, but it will also allow us to tap our full creative potential to be even more successful in our active lives.